Hayes & Stolz Ind. Mfg. Co. uses a combination of creativity, state-of-the-art technology, and years of expertise to design and produce a line of mixing equipment that is unsurpassed in efficiency, fast mix time and durability. Hayes & Stolz has invested countless hours in the development and testing of various ribbon and paddle mixer configurations in an ongoing effort to deliver the most efficient mixers possible. 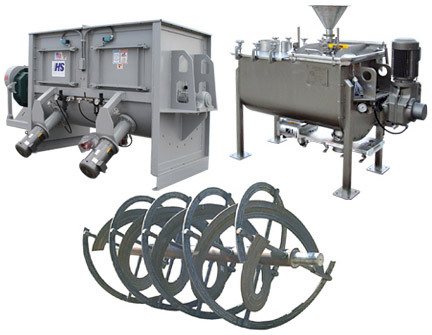 Each type of mixer has numerous variables that must be brought into balance to achieve homogenous mixing. Hayes & Stolz is able to design both ribbon and paddle type mixers with the precise balance of shaft speeds, agitator component pitch, component widths and spacing, along with width-to-length body ratios in order to deliver maximized performance. Performance is verified through frequent testing using the latest testing equipment and methods. Hayes & Stolz mixers are custom built to meet the most demanding mixing applications. If you have a special mixing need or problem contact us and let a qualified Hayes & Stolz Sales Engineer provide you with the most cost effective solution. Ribbon and paddle type mixers, both single and twin shaft designs, are available for testing specific products and/or applications. Tests can be conducted at the Hayes & Stolz Test Facility or a mixer can be shipped to the customer’s facility. Contact Hayes & Stolz for more information.